Top Five Best Foods for Oral Health What are the benefits of early orthodontic treatment? Valentine’s Day is the holiday to celebrate all the treasured relationships in your life. It’s a time to honor love in all shapes and forms with cards, social gatherings, and sometimes even binge eating of sweets. It's hard to look the other way when grocery stores and pharmacies are invaded with goodies connected to the Valentine’s Day theme, and especially if you’re on the receiving end of some of these sweets. We get it. In fact, we’re all for it! However, we also support a cavity-free smile. So in the interest of your dental and general health, and because we think it’s genuinely tasty, Dr. Kevin Mancini recommends an alternative to the Valentine treats you may be accustomed to: dark chocolate. Studies have shown that dark chocolate is high in flavonoids, an ingredient found in the cocoa beans used to make chocolate. Flavonoids can help protect the body against toxins, reduce blood pressure, and improve blood flow to the heart and brain. 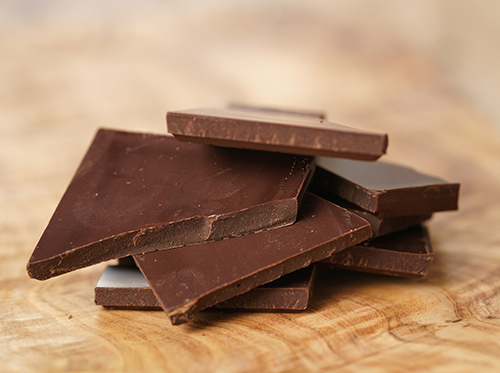 By opting for dark chocolate rather than milk chocolate, you get to reap these benefits! Pretty sweet, right? Just make sure to stick to high-quality dark chocolates that have undergone minimal processing. Not only does dark chocolate provide some nice benefits for your overall health, it also helps protect your teeth against cavities! According to the Texas A&M Health Science Center, dark chocolate contains high amounts of tannins, another ingredient present in cocoa beans. Tannins can actually help prevent cavities by interfering with the bacteria that causes them. Think of them as scarecrows for bacteria. They don’t always prevail, but isn’t it nice to have them there? Unlike many popular candies, dark chocolate is less likely to stick in the crevices of your teeth. Chewy, gooey sweets are more likely to hang around in your mouth for longer periods of time, which means they raise the odds of your harboring cavity-creating bacteria. While some dark chocolates have additives like caramel or marshmallow, it’s best to opt for the plain varieties, which are just as delicious. If you’re feeling festive, though, a dark chocolate with caramel is still better than a milk chocolate with caramel, so that’s the way to go! While dark chocolate has some pretty sweet benefits, the most important thing to remember (whether you go the dark chocolate route or not), is that moderation is key. That being said, we hope you have fun satisfying your sweet tooth and shopping for treats for your friends and loved ones. Happy Valentine’s Day from all of us at Mancini Orthodontics! 61 N. Hampstead Village Dr.